In Shade roof sails are the latest innovation in reducing heat and glare from glass roofs. 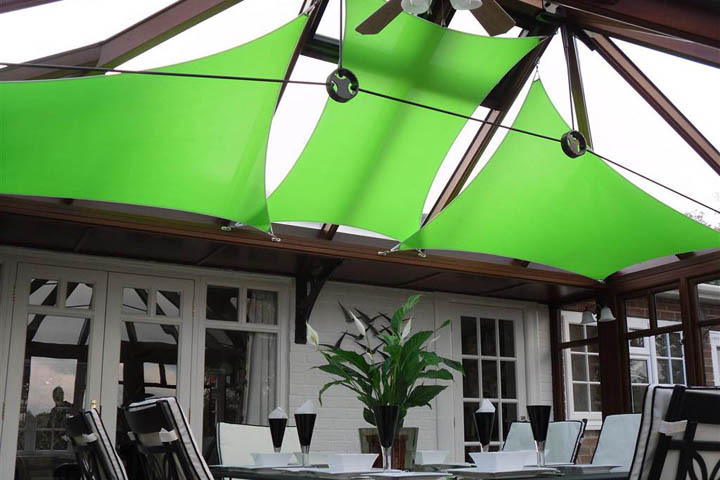 In Shade roof sails are fully customisable and are individually designed for each and every roof. Whether you need full coverage or just part coverage, they can be designed to suit your needs perfectly. In Shade roof sails come in six standard colours and have a custom colour option, to match your decor or to simply add a splash of colour. With over twice the thermal and solar reduction of perfect fit roof blinds they are the highest performing solution to solar heat and glare problems. Designed and manufactured in the UK In Shade roof sails are made using premium fabric and the latest technology with a 5 year warranty. Fully machine washable and fire retardent, our sails are a fantastic alternative to traditional blinds and will transform your space with sculptural form.